Palm Springs is a desert resort city with lots of activities and events. 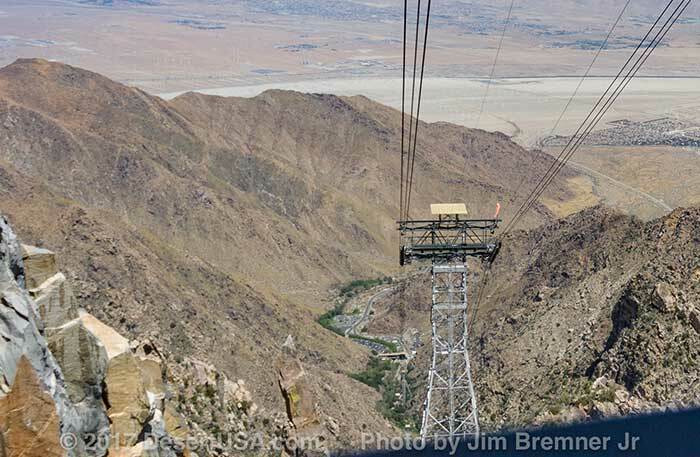 Play golf, swim, visit the hot springs or ride the Tramway; there's fun for the whole family. The fashionable resort city of Palm Springs is situated at the base of southern California's Santa Rosa Mountains, just south of Interstate 10, at the westernmost extension of the Sonoran Desert (also called the Colorado Desert). This upscale desert city sits at the foot of 10,000-foot Mt. San Jacinto, in an area long famous for its hot springs. Today it's the site of choice for many winter tourists, Hollywood productions and golf tournaments. Palm Springs is located at the western end of the Coachella Valley, which is composed of nine cities: Desert Hot Springs, Palm Springs, Cathedral City, Rancho, Mirage, Palm Desert, Indian Wells, La Quinta, Indio, and Coachella. The total permanent population numbers 180,000, with a seasonal rise to approximately 240,000. Palm Springs is sheltered by the Little San Bernardino Mountains to the north, the Santa Rosa Mountains on the south, and the San Jacinto Mountains to the west. This geography gives Palm Springs its famed warm, dry climate. Known for 354 days of sunshine and less than 6 inches of rain annually, its enviable winter temperatures average in the 70s with nights in the mid-40s. The dry desert heat of summer pushes daytime temperatures to the 100s, a special joy to Europeans. More than 2,000 years ago, Palm Springs' first residents were the ancestors of today's Agua Caliente Band of Cahuilla Indians. One of many Cahuilla bands, the Agua Calientes existed as peaceful hunters and gatherers, adapting to the extremes of desert summers and mountain winters. Much of tribal life centered around the lush vegetation and abundant water in the area known as Indian Canyons, site of North America's largest natural fan palm oases. In 1863, a smallpox epidemic killed thousands of the Agua Caliente. In 1853, a government survey party mapped Palm Springs and its natural hot springs mineral pool -- now the site of the Spa Hotel and Casino -- and established the first wagon route through the San Gorgonio Pass (now I-10). In 1877, as an incentive to complete a railroad to the Pacific, the US government gave Southern Pacific Railroad title to the odd-numbered parcels of land for 10 miles on either side of the tracks running through the Southern California desert around Palm Springs. The even-numbered parcels of land were given to the Agua Calientes, but federal law prohibited them from leasing or selling the land to derive income from it. In 1884, Judge John Guthrie McCallum of San Francisco arrived in Palm Springs with his family, seeking health for his tubercular son. The first permanent non-Indian settler, Mc Callum purchased land from Sourthern Pacific and built an elaborate aqueduct. Dr. Welwood Murray built the first hotel, The Palm Springs Hotel, in 1886. Palm Springs continued attracting more visitors and non-Indian residents, but it wasn't until President Eisenhower signed the Equalization Law in 1959 that tribes could realize profits from their lands. During these years Palm Springs grew rapidly. In 1909 Nellie Coffman's Desert Inn opened, as did a garage for servicing the vehicles which brought visitors from the East Coast and Los Angeles, and a school for the children of handful of year-round residents. By the time it was incorporated in 1938, the Village of Palm Springs had become world famous as a winter playground for Hollywood stars, European royalty and business tycoons, all who came to enjoy the endless sunshine and serenity of the desert. During World War II, the desert became training grounds for General George S. Patton's troops as they prepared to invade North Africa. El Mirador Hotel, second home to the stars and the site of today's Desert Regional Medical Center, served as Torney General Hospital, treating U.S. wounded. Italian prisoners of war, housed at the adjoining detention camp, labored at the hospital. The airfield, built to handle military cargo and personnel planes, would become Palm Springs Regional Airport. Once a small landing field and the first major Indian land purchased following the 1959 Equalization Law, the airport welcomes the 21st century as Palm Springs International Airport with flights nationwide and to Canada. The post-war era ushered in tremendous growth as Palm Springs' natural environment was no longer a secret of just the wealthy. With tourism's growth, attractions and resorts flourished. Development spread "down valley." With the advent of air-conditioning, visitors and residents stayed year-round. Today, the Agua Caliente Band of Cahuilla Indians is a vital part of the Palm Springs community. Individually and as a tribe, the Agua Calientes are the largest landowners in the city with nearly 6,700 acres within the city limits. Many major hotels and facilities, such as the Palm Springs Convention Center, are sited on leased Indian lands. The Spa Hotel and Casino is just one example of the Agua Caliente's economic development. Known for diversity in dining, the Village of Palm Springs offers hundreds of restaurants with a variety of cuisines and price ranges. The acclaimed revue the Fabulous Palm Springs Follies, musical offerings at The Annenberg Theater in the Palm Springs Desert Museum and renowned talent at the McCallum Theatre for the Performing Arts in Palm Desert fill the bill for evening entertainment. There is also a great Farmers Market every Saturday morning. Off-Road in Southern California's deserts, check out our Mojave Road Guide and The Bradshaw Trail. (near I-10) These hard to find guides will take you on a adventure though time. Palm Desert, California: 13 miles east. Indio, California: 22 miles east. Twentynine Palms, California: 54 miles north. Yucca Valley, California: 45 miles north. Banning, California: 25 miles west. San Bernardino, California: 55 miles west. Los Angeles, California: 110 miles west. Anza-Borrego Desert State Park: 67 miles south. Joshua Tree National Park: 55 miles northeast. Lake Cahuilla Park: 8 miles east. Agua Caliente Indian Reservation: 5 miles south. San Bernardino National Forest: 20 miles south. George S. Patton Memorial Museum: (Chiriaco Summit) 52 miles east.